A group of high school students in San Francisco took a trip to the U.S.-Mexico border as part of an immersion program where they were able to hear first-hand stories from migrants. Christie Smith reports. A group of high school students in San Francisco took a trip to the U.S.-Mexico border as part of an immersion program where they were able to hear first-hand stories from migrants. Students from St. Ignatius College Prep began planning the trip in November, and as the issue of immigration in the U.S. kept heating up, the trip took on more significance. "Each morning we wake up and walk through the port of entry into Nogales, Mexico," said Chad Evans, one of two educators traveling with the eight students. "We spend most of our time accompanying migrants, we work in an aid center serving food and listening to people’s stories and provide some most basic support." Students get to hear stories from people seeking asylum as well as stories of optimism. "There is so much more to it than one might think that you really have try to understand different perspective," said Evans. In some cases, students met people who were later sent to their native country, something students struggled with. "I built relationships with a group of migrants, at the same time it was saddening when the next day they’re gone," said student Quinn O’Connor. 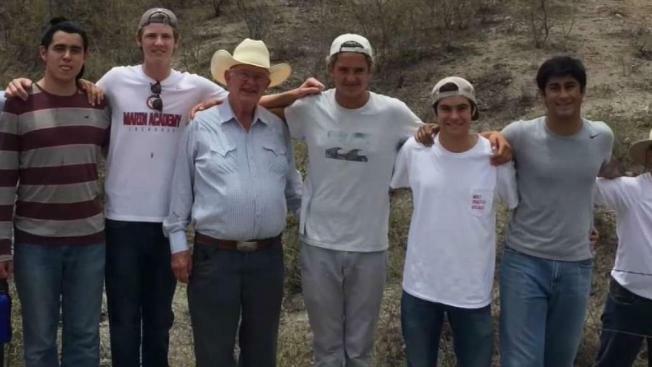 In addition to meeting people who were deported or detained, they also met ranchers along the Arizona border and spent time with border patrol who told them it was "their duty to protect the borders." "We don’t want to tell them, 'this is what you need to think or that’s what you need to think' we want to give them the opportunity to form their own conscience," said Principal Patrick Ruff. Students return Saturday and say they would recommend the trip to their classmates.